Summer time was when foxes were supposed to work hard, gathering food for winter. When the snow came all the animals hid and there was nothing for the foxes to eat. Jerry Fox didn't want to work and gather food. He loved summer. 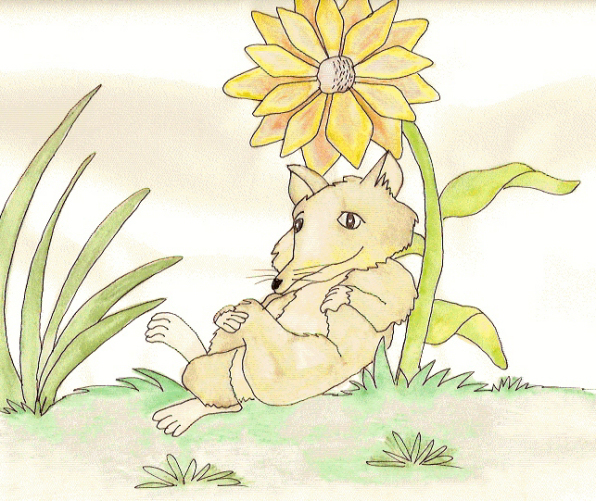 There was nothing he'd rather do than lie under the shade of a giant sunflower and listen to the birds chirp and the animals chatter. “Jerry, you'd better get to work. Summer is almost done and you've not got any food stored up for winter. You'll be sorry,” said Kevin Fox. Jerry ignored the other fox and closed his eyes, listening to the sound of the river flowing past. “But Jerry, soon the snow will come and there won't be any food. You'll be sorry.” Lori ran off to find more food. A dozen other foxes ran past and all of them warned Jerry, but he didn't care. He was enjoying the sunshine. Jerry went to find a place to stay dry. All the other foxes were gathered inside a big, hollow oak tree trunk. “You can't come in here, Jerry,” said Kevin. “We've all done our work and gathered food. You didn't feel like it, so now you can go find somewhere else to stay.” Kevin pushed Jerry out of the tree trunk onto the ground. “I'm a fox. I can't fly,” Jerry cried. “We'll carry you,” the bird said. So Jerry flew south for the winter with the birds. In fact when spring came and they all headed north, Jerry decided to stay in the south, where it was always warm and where he never ever had to worry about rain or storing food.